Many smart young women today know to find mentors, network and self-advocate, but don’t always take the next step. Do they assume their mentor is always right? Could their networking efforts be more effective? Could they improve the way they self-advocate? 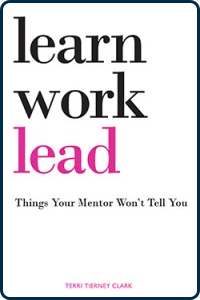 Learn, Work, Lead- Things Your Mentor Won’t Tell You teaches women in the first ten years of their careers how to analyze their own workplace decisions and optimize their actions for the biggest impact. The book is a cutting-edge career and job search guide, filled with meaningful real-life stories. It offers young professional women essential skills and expert advice to successfully navigate in a gender-biased workplace. This quick-reading guide gives women the tools they need to learn in their work now so that they will be chosen to lead in the future.